Mr. Blatter, ladies and gentlemen. I am very proud to be able to attend this wonderful annual ceremony for the FIFA Ballon d’Or. It is simply the greatest honour to be presented with the prestigious FIFA Presidential Award. It came as a great surprise to me when I received the message from Mr. Blatter last December informing me about this prize. I have been writing for the past 62 years as a journalist for sports – and above all football. I have covered ten different World Cups in person, from the 1974 Finals in West Germany to the Brazil World Cup last year, and my articles have filled many pages in newspapers and magazines. But although I am somewhat proud of their volume and contents, the truth is that everything I have ever written has been for a Japanese audience, and in the Japanese language. My work has not been read around the world. And so compared to some of the globally renowned football journalists I have befriended over my career, I am little more than a local writer for Japan. When I received the message, I wondered why FIFA would seek to honour a single journalist from the Far East with the Presidential Award. I came to the conclusion that Mr. Blatter must have recognised the media’s contribution to Japanese football’s rapid growth over the past few years, and decided to offer the prize to me as the oldest surviving member of the Japanese football press. 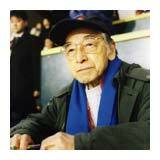 Japanese football actually has a long history, with the JFA in existence for 94 years since its foundation in 1921. During this time, many excellent journalists have gone before me, and various television pundits have served as pioneers for our sport. There were several other fine writers in my generation, and even today, I have friends who continue to travel to the World Cup Finals beyond the age of 80. To these friends, and to the ever-increasing ranks of younger journalists in the Japanese media, I would like to stress that my receiving this great honour as the oldest football journalist in Japan shows how much importance FIFA places in the media. In 1979, Mr. Blatter was part of the FIFA organising committee at the second FIFA World Youth Championship in Japan, where a 19-year-old Diego Maradona played a starring role. I remember that there was no French interpreter at the press conferences for the FIFA President, João Havelange. So Mr. Blatter would translate his French into English, which I then translated into Japanese for the local journalists. Ever since, Mr. Blatter has always been very favourable towards Japanese football, and I would like to express to him my deep gratitude for his longstanding support. Unfortunately, my English has not made any progress since that tournament, so I was a little bit hesitant about actually coming to the ceremony today. But my young colleagues in Japan were very encouraging and said I must come – if only to meet Manuel Neuer, Cristiano Ronaldo, and Lionel Messi. They told me not to forget to bring them back some autographs.